The carpets in your home are a significant investment that can be difficult to keep clean. 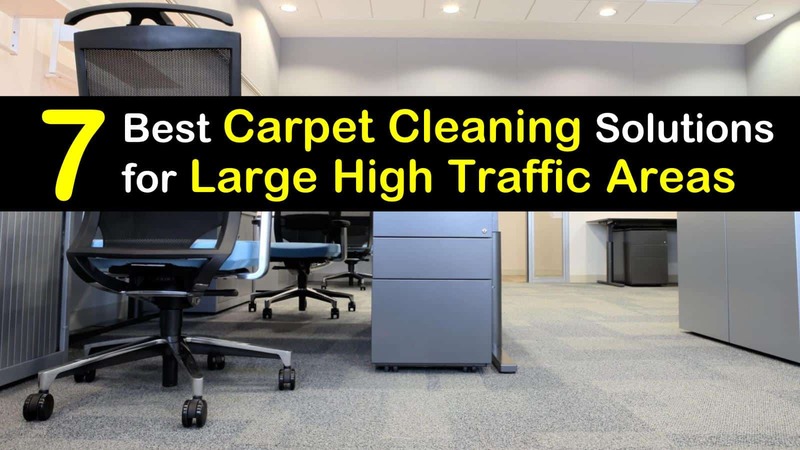 Along with the dirt and stains from spilled drinks and pet accidents, there are the high traffic areas that quickly become dirty and look dingy. Many people will hire professional carpet cleaners to clean their carpets, but this can be costly. With a few simple ingredients, you can maintain your carpets with the best carpet cleaning solutions for high traffic areas. There are several different commercial and homemade carpet cleaners that will not only destroy any stains that you may have on your carpet, but they will also remove the odors that have accumulated over the year. There are regular paths that you and your family take when walking, which tends to leave a dirt trail on the carpet over time. The carpet in this area experiences a lot of wear and tear and will require a lot of elbow grease to get the area clean. There are several ways that you can clean large high traffic areas. 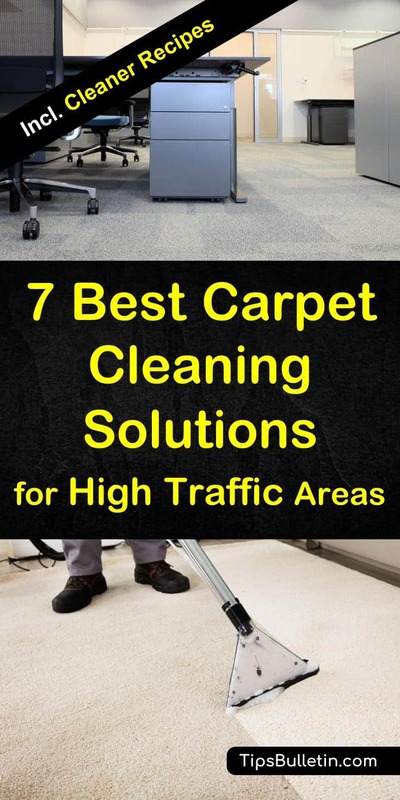 No matter how often you clean your carpet, those areas that see a lot of traffic never really look clean. There are several different options you can use to clean these areas, from a simple DIY carpet cleaning solution to a variety of commercial products you can purchase at the store. To keep these high traffic areas from becoming dingy, you should clean them twice a year, while cleaning your entire carpet annually. There’s nothing worse than a carpet that smells dirty. Since you can’t just pick your carpet up and shake it off, you have to find ways to clean it properly. Short of spending a fortune on a steam cleaner, you can create a homemade dry-carpet cleaning solution that works great. This solution is safe to use around your pets and kids, can be used as car carpet cleaner and is made from everyday ingredients that you probably already have in your home. Place the baking soda and the other ingredients in a blender. Pulse on low speed until the ingredients have an even consistency. Pour the cleaner into a sprinkle-top container. Vacuum your carpet to pick up as much dirt as possible. Generously sprinkle of the carpet and let sit overnight. With your vacuum cleaner, vacuum up the reside. This homemade foaming carpet cleaner uses ingredients that you can quickly pick up at the store. This DIY carpet shampoo recipe is intended to be used for machine and can tackle not only your carpet’s high traffic areas but the stairs and area rugs in your home. Using vinegar in the recipe won’t leave behind any residue and brightens and deodorizes your carpet, as well as being a natural homemade fabric softener. Mix the ingredients in a bowl, adding the liquid dish soap last to avoid creating too many bubbles. Spot test the mixture on an inconspicuous area of your carpet to test for colorfastness. Mix until well combined then pour into the carpet cleaner’s soap tank. Following the manufacturer’s instructions, thoroughly clean your carpet. If you have a carpet cleaning machine or plan on renting one, you don’t have to settle for buying the commercial products. With just a few simple ingredients that are probably a staple in your home, you can make a great carpet cleaner for your machine that will work just as well as the store-bought solutions. In a large bowl, mix the ingredients. Make sure to add the dish soap last to prevent too many bubbles from forming. Mix thoroughly to ensure the ingredients are combined. Pour the solution into the soap tank of your carpet cleaning machine. Follow the manufacturer’s instructions for use. Not only do high traffic areas look dirtier than the rest of your carpet, but they tend to have more ground in soil and stains from the heavy use. If you have stubborn stains that you can’t remove with a simple cleaning, then you might have to treat the area with this easy-to-make carpet stain remover. Sprinkle the baking soda over the stain and allow to stand for ten minutes. While the baking soda sits, mix the white vinegar, dish soap, and warm water in a small bowl. Vacuum up the baking soda. With a white cloth or paper towels, dab the solution into the stain, being sure to rub it into the carpet fibers. With a second dry cloth or dry paper towels, blot the carpet dry. Not everyone has the time or courage to make a cleaning solution from scratch. If this is you, you can still clean your high traffic areas with a little help from some great commercial products. When buying a commercial carpet cleaning solution, be sure you are getting one that is compatible with the kind of carpet you have. Here are three of the most popular commercial carpet cleaners that do a great job of eliminating stains and odors from high traffic areas. For more than 140 years, Bissell has been bringing carpet cleaning products to consumers. Their Bissell Professional Deep Cleaning carpet cleaning solution has twice the cleaning agents as many of the other formulas on the market. It helps to eliminate even the toughest, ground-in dirt, keeping your carpets looking good and staying cleaner for longer. This formula deep cleans and protects your carpet while removing odors. Since 1908, Hoover vacuums have been trusted to provide reliable and innovative cleaning solutions. Their Hoover Platinum Collection Professional Strength Carpet and Upholstery Cleaning Solution is effective at removing tough stains like red wine, grease, coffee, cosmetics, and more. It is great for getting high traffic areas clean and eliminating odors. For over 40 years, Rug Doctor has been empowering consumers to achieve professional quality carpet cleaning results themselves. Their Platinum Pure with Oxy carpet shampoo is an all-purpose cleaning solution that deep cleans and tackles tough stains from everyday spills and accidents. It neutralizes odors while providing a deep clean and extracting dirt, oil, and stains from your carpet. Whether you decide to make a homemade carpet cleaner, or buy a commercial product, getting your carpet’s high traffic areas clean shouldn’t cost you a fortune. You can create the best carpet cleaning solution for high traffic areas with simple, inexpensive ingredients that you can buy at any store. These solutions are easy to make and are safe to use around your pets and family. Thank you for reading this article, we hope you discovered new solutions to your most significant home cleaning issues. Please feel free to share the information with all your family and friends.